And that’s about it. Forget the numbers and items on that above “scope,” as they’re just there as an example. Generally, my experience with such bids is that a lot of knick knack work will be left undone. There will generally be confusion as to what was agreed to, particularly in terms of what type of materials are to be used, the smaller items, and sometimes even the location. A friend of mine hired one contractor and told him to put the laundry hookups on the first floor, but he instead put them in the basement despite the verbal agreement. Unfortunately, it wasn’t in the scope, so there wasn’t much that could be done after the fact except argue about it. Furthermore, costs can be hidden in those paragraphs of things they will do. If you’ll notice above, I put a lot of stuff under the “bathroom” category, but most of them were petty items (towel rod, toilet paper holder, door stop, soap holder). Unless you are putting in a diamond-encrusted toilet or a solid gold shower surround, there is no way that should cost $5,200. But it’s harder to spot these sorts of things when a contractor is quoting multiple items at a time. This is why demanding individual line items is so important. It’s much easier to spot things that are overpriced. You can also bid things you are on the fence about and see whether the price makes it worth it to do or not. It’s easier to compare one contractor’s bid to another since you know they are bidding the same thing. It reduces miscommunications, and you can make sure the contractor is bidding all of the work you want done. So how do you put together a scope of work? We’ll start with your first walk through, before you get the property under contract. Of course, you might be better than me at estimating up front and not need to add the contingency. From experience, I’ve found that unforeseen items and things I missed usually add up to about that, so this is what works for me. You will need to customize this somewhat. As far as how to estimate expenses, it depends on what materials you are using, what quality contractor you are using, and sometimes, where you live. I recommend analyzing the quotes you’ve gotten from contractors, asking contractors and other real estate investors in your area, and analyzing the prices of various things where you live. This is something you will definitely want to learn. That being said, by being able to put this estimate together quickly and on one sheet, you can make your offers with confidence that you won’t rehab out all of your equity. But this alone isn’t something you can send to a contractor for a bid. For that, we need to put together a scope of work. With scopes of work, you want to catch every little item. For this reason, you really want to make sure the utilities are on. Sometimes that will require doing work up front, and it’s usually better to get that done and then do the scope of work afterwards. I’ve known people who just bring in a notepad and start making notes. But I find the checklist to be more helpful, as I’m less likely to forget anything. (On an aside, this is true for almost everything; for more, read The Checklist Manifesto: How to Get Things Right .) As you can see, on the right, there is a space for extra items that aren’t listed in the checklist. 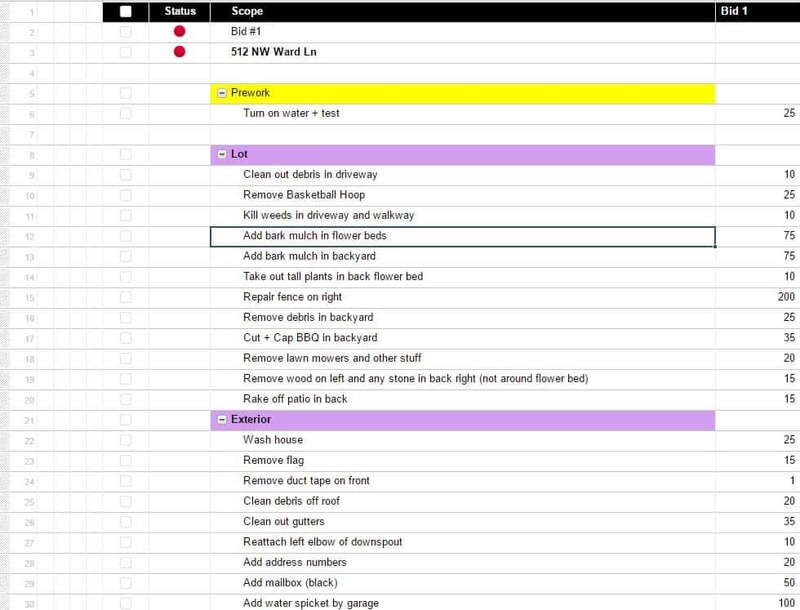 Your scope of work system doesn’t need to look like mine, but it should be very thorough and detailed. Don’t rush through this process. It takes us between 30 minutes to as much as two hours to fill one of these out depending on the size of the apartment unit or house and how much needs to be done. Punchout (These are the last items that need to be done after the painting and flooring. It includes things like outlet covers, door stops, installing the appliances, cleaning the carpets, and general cleaning). We use a program called Smartsheet and after the scope is done, we send it out to any contractor that is going to be bidding the project. We also create a budget up front to make sure the quotes are in line with what we are thinking. (This is also good practice when it comes to determining how much rehabs will cost.) We also demand they put the bid into that template. Early on, it may be hard to demand this of a contractor you’ve just met, but I would certainly request it. It is much easier to compare different quotes if they are on the same template. The vast majority of contractors we’ve met have had no problem with doing this. After a project is accepted, we also ask contractors to put any add-on requests at the bottom of the page. Regardless of whether you want to use a system like ours or one quite different for putting together scopes of work, it is very important to be thorough and consistent about it. A messy scope of work will lead to a messy project. And a messy budget will lead to a blown budget. As Abraham Lincoln once said, “Give me six hours to chop down a tree, and I will spend the first four sharpening the axe.” Do the leg work up front and the project will go smoothly more often than not. How do you put together your scope of work? Nice write up. I am currently working on my process to create better estimates and for my rehabs. Would you be willing to share your 6-page checklist with us? Also, is your Smartsheet SOW document a custom document you built, or is it a template from them. Sure, just PM me. The Smartsheet document is pretty simple. 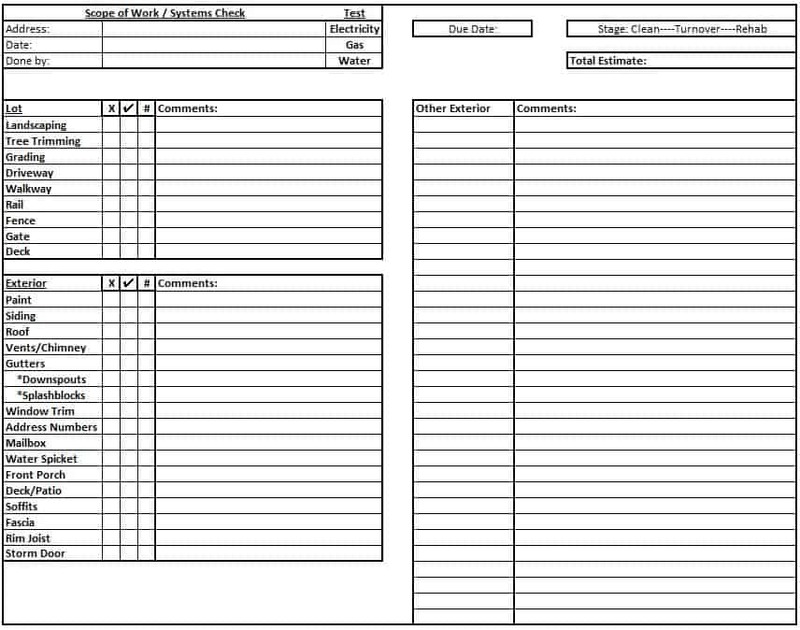 We have some other things in Smartsheet that are more complicated and take advantage of a lot of the features, but other than attaching pictures to each line item, we don’t have much fancy for our actual scopes of work. Great article. I am working through something pretty similar right now. You can’t underestimate the power of getting every little thing that needs done out of your mind and documented. Great article! I love checklists. My biggest fear is that I will miss something. I hope I can get copies of the 1 page and 6 page templates in speadsheet format. I will PM you. Thanks. The problem you describe is extremely common in this industry and something we’ve had to deal with a lot in the past. Our current system avoids it for the most part. Thanks for sharing. Estimating repair costs is something I could improve on. I tend to bring in my contractor to get a feel for what they’re thinking. Thank you for writing this article. Unless you’re buying a cream puff property you need to read this article. Great advice! Great article, thank you for writing and sharing your experience! It was the reminder I needed to get my scope of work more detailed!! I’m the worlds most disorganized person in the BRRR business. I usually end up working 12-16 hours a day for the last week of a project. Getting out at midnight with tenants moving in at 7AM. My budget is always a $100 per day in renovation, this holds true for my last 8 projects. Since I do all my own work and make about $250K per year being totally disorganized and pay almost no taxes works for me. What I lack in organization I make up in profit and building trades skill. Profit is the key. Improvise and simulate as well as cover and camouflage will always out perform youth and skill. It sounds like you’ve got a good thing going, but I will say, there is a great opportunity for you in improving your organization. I think organization (and the systems it makes possible) are what makes scaling and dramatically increasing your profitability possible. I would try to make that a priority. Nice article Andrew! This helps a lot. I’m working on implementing systems and procedures to make life easier. Always looking for templates to facilitate the rehab process. I will PM you as well, thanks! I love spreadsheets and lists so this makes me super happy. Definitely, agree it’s better to go in and have a list you can reference than trying to remember it all in your head. Great article! Thanks for the great read! I’m just starting out and it’s hard to get this organized and coordinate work with contractors. I’ve been just walking properties with GC’s with no SOW. I just tell them i want this, this, and this done. And he goes home and write a proposal. Sometimes, it’s itemized, sometimes its not. I want to get better at this but need some guidance. 1. When do you share the SOW with contractors? 2. How do you handle ‘change orders’. I’m just starting out so it’s hard to build this list of todos. 3. Are your bids labor + material? 4. What does your typical sow look like? 1. We share the SOW when it’s done and in the final form (the one in Smartsheet). 2. Change orders are requested through Smartsheet at the bottom of the Smartsheet spreadsheet (so it doesn’t conflate with anything that we already agreed to. Then we accept or deny it. 3. We usually bid labor + materials. But you can do both with this. 4. The typical finished SOW looks like the one I posted a picture of. Good article – to the point, good info. I just created my first SOW, merely a Word document with a listing of possible reno/repair items. I now realize many items on my list are ambiguous; being more specific, and with better organization, would definitely help. Can I also ask for your 1- and 6-page templates? I’d sure appreciate it! I’ll PM you. Wasn’t able to PM you here at Bigger Pockets, so I PM’d you through Facebook. Thanks again. Hey Cliff, we have to be connected to share documents. I just sent a request, so please accept and message me back when you do and I will send them to you. Just accepted; let me know what else I may need to do. Thank you! Wow Andrew what a great post ! This is gold for a new investor working on implementing systems. I am Going to PM you as well ! Thank you.